Though commonly thought to be a vegetable, cucumber is actually a fruit and is full of good health. However, there's a reason to eat cucumbers all year long. It's high in beneficial nutrients, as well as certain plant compounds and antioxidants that may help treat and even prevent some conditions. Cool cucumber keeps you hydrated. Fights heat, both inside and out. Eating cucumber gives you relief from heartburn. Applying cucumber on your skin gives you relief from sunburn and itchy skin. Flushes out toxins and waste products from your body. With regular use, cucumber is known to dissolve kidney stones. Nourishes you with vitamins like A, B and C, which boost immunity, give you energy and keep you radiant. Aids in weight loss. Enjoy cucumbers in your salads and soups. Smooths hair and nails. 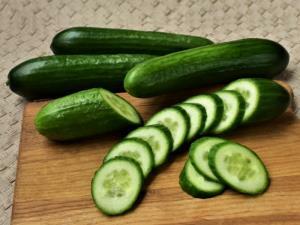 Silica in cucumber makes your hair and nails stronger and shinier. For dry and rough hair, make some cucumber paste, mixing it with water. Then just gently massage the concoction on your head and gradually see the difference on your hair and scalp health. Good for diabetics. Cucumber contains a hormone needed by the cells of the pancreas for producing insulin for diabetic patients. Protect Your Brain. Cucumbers contain an anti-inflammatory flavonol called fisetin that appears to play an important role in brain health. In addition to improving your memory and protecting your nerve cells from age-related decline, fisetin has been found to prevent progressive memory and learning impairments in mice with Alzheimer's disease.